We have a lot of cookbooks; it’s a side effect of blogging. When I reach onto the cookbook shelf, it is clear that some of the cookbooks are well-used and some have hardly been open. Some are falling apart, and some look brand new. 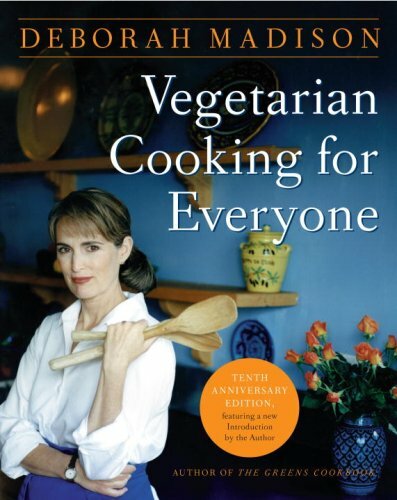 Here’s a list of the five most worn, most loved vegetarian cookbooks in my kitchen. No, it isn’t the esoteric, limited-audience work the title page suggests; it’s one of the most important cookbooks in years. The American-born Devi, who as the disciple and personal cook of an Indian spiritual leader spent eight years off and on travelling with him in India and elsewhere, has assembled about 500 detailed, carefully written recipes representing the vast range of Indian cooking styles. They provide excellent, workable versions of – among much else – Indian pancakes, flitters, dumplings, breads, cheese and yogurt dishes, and sweets and pastries. (American vegetarians should note that the recipes use no eggs.) Only a real hater of Indian flavors could fail to come away with ideas almost begging to be adopted in everyday use – say, spicy creamed spinach. There are attractive experiments with American ingredients like maple syrup and jicama as well as the dozens that must be sought in Indian stores. But the recipes pale in interest beside the vast amounts of information on ingredients, techniques, equipment, and critical culinary indefinables. A classic book of soy-based recipes from some of the best cooks on “The Farm,” an intentional community in rural Tennessee. Features over 250 cholesterol-free recipes for family favorites. Also included are detailed instructions for making tofu and other soyfoods at home, plus comprehensive nutritional information for a vegan diet. Our food choices do affect the planet! 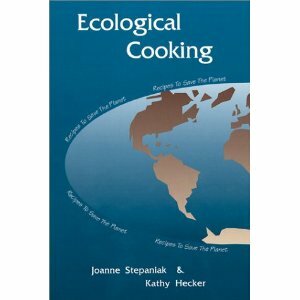 Ecological cooking can be good for the environment (using foods low on the food chain), good for our sense fo well-being (placing ethics on the dinner table), and good for our bodies (a vegan diet reduces the risk of heart attack by 90%). The elegant simplicity and exquisite flavor of Deborah Madison’s food make her one of America’s leading cooks. In Vegetarian Cooking for Everyone, she offers more than great food: her book includes comprehensive information about ingredients and techniques, plus more than 800 recipes. The recipes range from dishes as familiar as Guacamole to those as distinctive as Green Lentils with Roasted Beets and Preserved Lemons, and Cashew Curry. The 124-page chapter titled “Vegetables: The Heart of the Matter” is a virtual book of culinary revelations; you could use it as a manual on buying and preparing vegetables. Madison provides equally inspired recipes and guidance for everything from grains and soy to dairy foods and desserts. 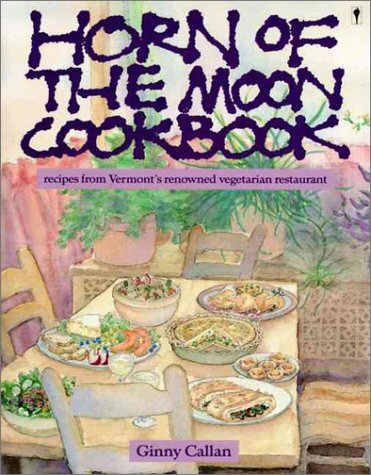 The Horn of the Moon Café’s vegetarian cookbook is one we’ve an been waiting for. It offers a splendid array of recipes perfected during many years of serving customers at the popular restaurant in Montpelier, Vermont. The café specializes in dishes that feature healthful, meatless meals with a gourmet, international flair. Ginny Callan’s Horn of the Moon Cookbook contains irresistible ideas for every meal of the day, from Blackberry Buttermilk Coffeecake and a Brie with Fresh Herb Omelette for breakfast to Chilled Melon Soup and Asparagus Fettuccine for lunch to Mexican Vegetable Pie or Stuffed Shells Florentine for dinner. Desserts include Chocolate Cream Cheese Brownies, Mandarin Orange Cake, and Raspberry Pie. Using whole-grain flours and natural sweeteners, Ginny’s dishes combine principles of good nutrition with loving attention to the taste, color, and texture of fresh, natural foods-and the results are delightful. Whether you’re cooking a simple meal or preparing a banquet for a festive occasion, you’ll find a wealth of pleasure in the Horn of the Moon Cookbook. There are many more classic vegetarian cookbooks, like the Moosewood series by Mollie Katzen, but these five cookbooks are the ones I rely on the most to feed my family. 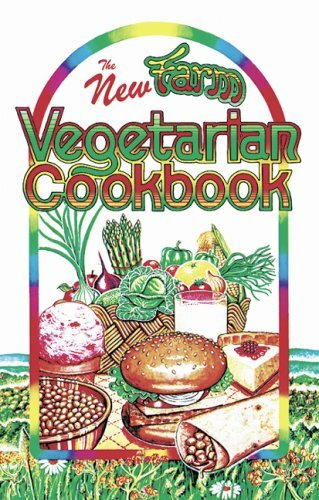 What are your favorite vegetarian cookbooks? PS: I rarely have all of the ingredients for a recipe. I view cookbooks as guides rather than following them to a tee. Give yourself room to experiment, and you will be pleased with the results. 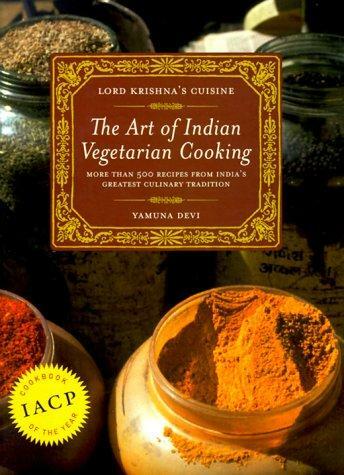 I LOVE Lord Krishna’s Cuisine: The Art of Indian Vegetarian Cooking! They have a pretty rockin’ potato & cauliflower curry! Another I love to recommend is Sundays at Moosewood Restaurant: Ethnic and Regional Recipes from the Cooks at the Legendary Restaurant (Cookery) by Moosewood Collective. We love the Moosewood Cookbooks! We cook from them weekly. I have many vegan and vegetarian cookbooks but none of the 5 you listed I can’t wait to order one and try new recipes!